Reginald Heber was born in 1783 into a wealthy, educated family. He was a bright youth, translating a Latin classic into English verse by the time he was seven, entering Oxford at 17, and winning two awards for his poetry during his time there. After his graduation he became rector of his father's church in the village of Hodnet near Shrewsbury in the west of England where he remained for 16 years. He was appointed Bishop of Calcutta in 1823 and worked tirelessly for three years until the weather and travel took its toll on his health and he died of a stroke. Most of his 57 hymns, which include "Holy, Holy, Holy," are still in use today. ”He retired into his own room, and according to his invariable custom, wrote on the back of the address on Confirmation 'Trichinopoly, April 3, 1826.' This was his last act, for immediately on taking off his clothes, he went into a large cold bath, where he had bathed the two preceding mornings, but which was now the destined agent of his removal to Paradise. Half an hour after, his servant, alarmed at his long absence, entered the room and found him a lifeless corpse." Life, &c, 1830, vol. ii. p. 437. 1. Beneath our feet, and o'er our head. Burial. 2. Creator of the rolling flood. St. Peter's Day, or, Gospel for 6th Sunday after Trinity. 3. Lo, the lilies of the field. Teachings of Nature: or, Gospel for 15th Sunday after Trinity. 4. 0 God, by Whom the seed is given. Sexagesima. Gospel for 22nd S. after Trinity. 6. 0 hand of bounty, largely spread. Water into Wine, or, Gospel for 2nd S. after Epiphany. 7. 0 King of earth, and air, and sea. Feeding the Multitude; or, Gospel for 4th S. in Lent. 8. 0 more than merciful, Whose bounty gave. Good Friday. 9. 0 most merciful! 0 most bountiful. Introit Holy Communion. 10. 0 Thou, Whom neither time nor space. God unsearchable, or, Gospel for 5th Sunday in Lent. 11. 0 weep not o'er thy children's tomb. Innocents Day. 12. Room for the proud! Ye sons of clay. Dives and Lazarus, or, Gospel for 1st Sunday after Trinity. 13. Sit thou on my right hand, my Son, saith the Lord. Ascension. 14. Spirit of truth, on this thy day. Whit-Sunday. 15. The feeble pulse, the gasping breath. Burial, or, Gospel for 1st S. after Trinity. 16. The God of glory walks His round. Septuagesima, or, the Labourers in the Marketplace. 17. The sound of war in earth and air. Wrestling against Principalities and Powers, or, Epistle for 2lst Sunday after Trinity. 18. The world is grown old, her pleasures are past. Advent; or, Epistle for 4th Sunday in Advent. 19. There was joy in heaven. The Lost Sheep; or, Gospel for 3rd S. after Trinity. 20. Though sorrows rise and dangers roll. St. James's Day. 21. To conquer and to save, the Son of God. Christ the Conqueror. 22. Virgin-born, we bow before Thee. The Virgin Mary. Blessed amongst women, or, Gospel for 3rd S. in Lent. 23. Wake not, 0 mother, sounds of lamentation. Raising the Widow's Son, or, Gospel for 16th S. after Trinity. 24. When on her Maker's bosom. Holy Matrimony, or, Gospel for 2nd S. after Epiphany. 25. When through the torn sail the wild tempest is streaming. Stilling the Sea, or, Gospel for 4th Sunday after Epiphany. 26. Who yonder on the desert heath. The Good Samaritan, or, Gospel for 13th Sunday after Trinity. This list is a good index of the subjects treated of in those of Heber's hymns which are given under their first lines, and shows that he used the Gospels far more than the Epistles in his work. 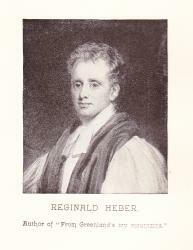 Reginald Heber (21 April 1783 – 3 April 1826) was an English bishop, traveller, man of letters and hymn-writer who, after working as a country parson for 16 years, served as the Bishop of Calcutta until his sudden death at the age of 42.